Lufthansa passengers flying from Frankfurt to Dubai on flight LH630 were in for a surprise on their way here. They were the first to experience the airline’s new prototype “VR Moving Map”, while on board the Airbus A330. Lufthansa VR – What is it? 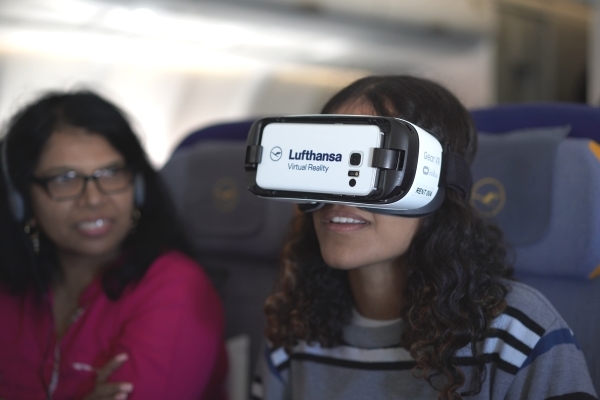 Passengers wearing special Lufthansa VR glasses were able to view the moving landscape below them as a 3D map and even take part in 360° virtual excursions. For example, as the aircraft flew over Vienna, some passengers virtually rode the Prater Ferris Wheel or even had the chance to virtually attend one of the city’s famous classical concerts. The prototype was developed by Lufthansa in cooperation with 3spin, Lufthansa’s lead agency for virtual and augmented reality.